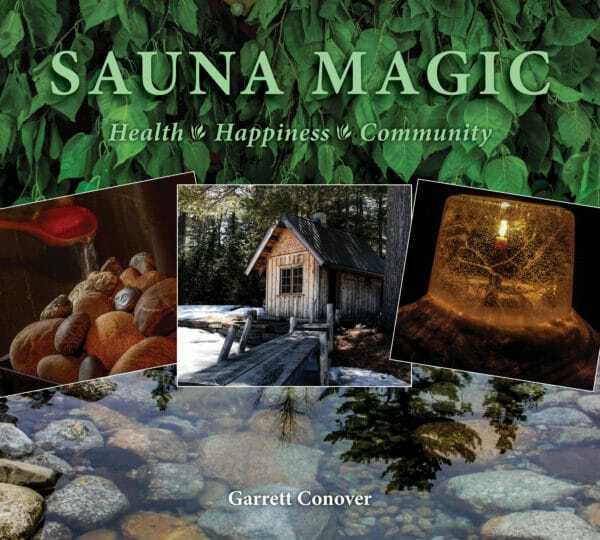 Sauna Magic is a lyrical and evocative celebration. Imagery and story embrace a tradition that sustains calm renewal and thoughtful quiet in a world that too often seems overly busy, and overwhelming. The introductory chapter invites readers into a remarkable realm provided by the elemental resonance of fire, stone, water, and wood, and a ritual shared widely all over the world. Subsequent chapters profile a diversity of saunas and their people. Each exploration personalizes experience and a dreamscape that will reward seasoned practitioners and intrigued newcomers alike. Within is an accessible luminous love song to health, happiness, and community. Garrett Conover is best known as the cofounder of North Woods Ways, the classically resonant canoe and snowshoe guiding service leading wilder­ness trips in Maine, Quebec, and Labrador from 1980 until 2007. Garrett is author of Beyond the Paddle. His novella, Kristin’s Wilderness, has won four awards. The Snow Walker’s Companion was coauthored with Alexandra Conover Bennett, and is now in its fourth printing. Writing and photography are continuing inter­ests, and Garrett remains in demand as a presenter of North Woods Skills Workshops and Adventure Travel Slideshows, where the narration weaves a bit of his­tory, how-to, natural history, and the intrigue of glo­rious wilderness trails into each presentation. He is currently a craftsman and fabricator at Sheldon Slate Products in Monson, Maine.